Could the crisis affect Spanish tourism? Crisis, crisis, crisis.... is all you can read and listen these days in the news, the streets, the market... But, what about tourism? What about our tourism? Do you think there will be a crisis also in Spanish tourism? Do you think there could be some kind of change of preferences? Have a look at this rather optimist article and try to give your opinion using the writing gidelines found in page 42 from your book. Software developers vs language teachers? Developers in user-friendly human-computers interfaces and higher-level languages and authoring systems insulate the developer from the lower level workings of the computer, allowing comparatively complex applications to be written with relative ease. Do you actually think that applications to create quizzes like "Hotpotatoes" are perfectly easy and intuitive to use stuff for language teachers or they need some special training and knowledge to use them? Use the comments button to answer to this question either in English or Spanish. What does this bonfire mean? Who is this guy here? Tell us if you have heard of this man, about gunpowder,treason and plot, etc. What do you think of Guy Fawkes? 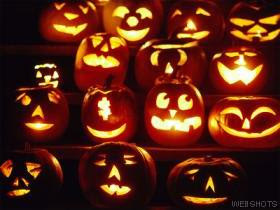 Halloween is round the corner, are you going to be a part of it?? Will you be a witch or a scarecrow? A black cat? Will you try Trick or Treat? Why do you think Halloween has become so popular in Spain? Have you heard of Samain as well? We are looking forward to reading your comments. Boo!